Is uncertainty synonymous with humility? Most postmodernists seem to think so. They definitely equate certainty with arrogance. The belief that no one can really know anything for certain has emerged as virtually the one dogma postmodernists will tolerate. Uncertainty is the new truth. Doubt and skepticism have been canonized as expressions of humility. Right and wrong have been redefined in terms of subjective feelings and personal perspectives. Those views are infiltrating the church too. In some circles within the visible church, cynicism is now regarded as the most splendid of all virtues. A relentless tone of angst about too much certainty pervades every postmodern faction within modern churches. No wonder the emerging church began as a self-conscious effort to make Christianity more suitable to a postmodern culture. Emerging Christians were determined to adapt the Christian faith, the structure of the church, the language of faith, and even the gospel message itself to the ideas and rhetoric of postmodernism. The central propositions and bedrock convictions of biblical Christianity—such as firm belief in the inspiration and authority of Scripture, a sound understanding of the true gospel, full assurance of salvation, settled confidence in the lordship of Christ, and the narrow exclusivity of Christ as the only way of salvation—do not reconcile well with postmodernism’s contempt for clear, authoritative truth claims. The medium of postmodern dialogue thereby instantly and automatically changes the message. And the rhetoric of the Emerging church movement reflected that. How ironic that I am writing about orthodoxy, which implies to many a final capturing of the truth about God, which is the glory of God. Sit down here next to me in this little restaurant and ask me if Christianity (my version of it, yours, the Pope’s, whoever’s) is orthodox, meaning true, and here’s my honest answer: a little, but not yet. Assuming by Christianity you mean the Christian understanding of the world and God, Christian opinions on soul, text, and culture . . . I’d have to say that we probably have a couple of things right, but a lot of things wrong. Brian McLaren, A Generous Orthodoxy (Grand Rapids, MI: Zondervan, 2004), 293. I have gone out of my way to be provocative, mischievous, and unclear, reflecting my belief that clarity is sometimes overrated, and that shock, obscurity, playfulness, and intrigue (carefully articulated) often stimulate more thought than clarity. A Generous Orthodoxy, 23. A common theme that runs throughout most of McLaren’s writings is the idea of great danger in the quest to be right. Postmodern influences have come into the evangelical movement through other avenues as well. Beyond Foundationalism: Shaping Theology in a Postmodern Context, by Stanley Grenz and John Franke, was published in 2001 and made a significant impact in the evangelical academic community, garnering lots of positive reviews and stimulating numerous papers and lectures from evangelical leaders who evidently found much to agree with in the book. But as the subtitle suggests, the book pleads for a whole new approach to theology, with the goal of “contextualizing” Christianity for a postmodern culture. “The categories and paradigms of the modern world” are in collapse, the authors note in the book’s opening sentence. Stanley J. Grenz and John R. Franke, Beyond Foundationalism: Shaping Theology in a Postmodern Context (Louisville, KY: Westminster John Knox, 2001), 3. They go on to assert that Christian theology therefore needs to be rethought, revised, and adapted in order to keep in step and remain relevant in these changing times. Grenz and Franke argue that the Spirit of God speaks through Scripture, tradition, and culture, and theologians must seek to hear the voice of the Spirit in each one. Moreover, since culture is constantly in flux, they say, it is right and fitting for Christian theology to be in a perpetual state of transition and ferment too. No issue should ever be regarded as finally settled. The obvious casualty of all this is any sure and certain knowledge of biblical truth. That is okay with Grenz and Franke. They are convinced that every desire to gain a fixed and positive knowledge of any truth actually belongs to the collapsing categories of enlightenment rationalism. Beyond Foundationalism, 30. Certitude naturally comes under repeated attack in the book. This culminates in the incredible claim that certainty is ultimately incompatible with hope. Beyond Foundationalism, 248. Of course, there are some things we don’t yet see clearly and still hope for (Romans 8:24–25). But it seems rather far-fetched to conclude that there is nothing we can know with a true and settled certainty. Some readers have nevertheless found the Grenz-Franke argument persuasive, including John Armstrong. Armstrong is a writer, conference speaker, and former pastor who at one time was a defender of Reformation theology and a student of revival. The name of his ministry, Reformation and Revival, reflected that. Reformed dogmaticians and teachers on the conservative side seek a steady, unshakable and certain knowledge. . . . John Franke suggests that the agenda employed by such theologians “glorifies reason and deifies science.” I have changed my mind about the way to do theology, and I confess I now agree with Franke’s conclusion. "How I Changed My Mind," 1. Armstrong revealed how far he had moved from his starting point with this statement: “If there is a foundation in Christian theology, and I believe that there must be, then it is not found in the Church, Scripture, tradition or culture.” If Scripture is not the foundation for Christian doctrine, then what is? Armstrong’s answer echoes the central thesis of Beyond Foundationalism: “If we must speak of ‘foundations’ for Christian faith and its theological enterprise, then we must speak only of the triune God as disclosed in polyphonic fashion through Scripture, the church, and even the world.”  "How I Changed My Mind," 4. Armstrong, Grenz, Franke, and the emerging postmodernists have blurred the line between certainty and omniscience. They seem to presume that if we cannot know everything perfectly, we really cannot know anything with any degree of certainty. That is an appealing argument to the postmodern mind, but it is entirely at odds with what Scripture teaches: “We have the mind of Christ” (1 Corinthians 2:16). That is not to suggest, of course, that we have exhaustive knowledge. But we do have infallible knowledge of what Scripture reveals, as the Spirit of God teaches us through the Word of God: “We have received, not the spirit of the world, but the Spirit who is from God, so that we might know the things freely given to us by God” (1 Corinthians 2:12). 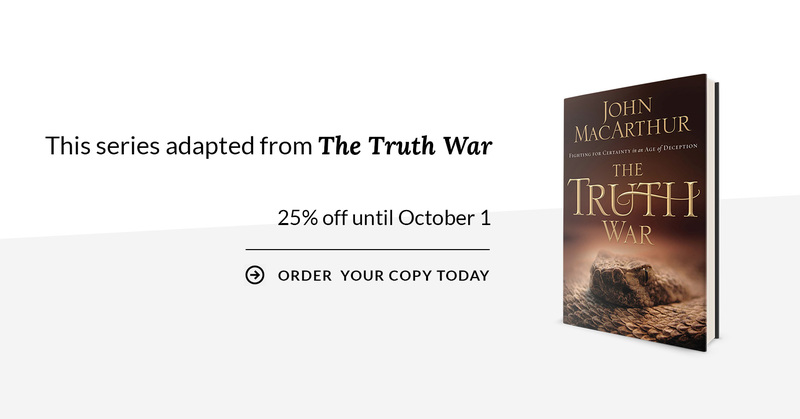 By such means, the ages-old war against truth has moved right into the Christian community, and the church itself has already become a battleground—and ominously, precious few in the church today are prepared for the fight. We need to be in a state of operational readiness—armed with the right weaponry and equipped with the right battle plan. And that’s what we’ll examine next time.